As a woman, leaving the house unprepared can lead to major disaster. Whether you encounter unwanted body odour, red lipstick on your teeth, a broken hair tie or mascara marks on your face where you shouldn't; these are all beauty and style mishaps no woman wants to face when they are out. However, all these situations can be avoided if you prepare your handbag with some of the simplest items that won't take up too much vital space in your bag! Forget carrying your full sized perfume, now many fragrances come in a small travel size perfect for your handbag! Not only is this lightweight but will also be easy to put in any size handbag, big or small. There is nothing worse that your red lipstick fading and you don't have it with you to reapply! Ensure you always have the colour lipstick/gloss you are wearing so you can reapply when necessary. Who knows whom you might bump into when you need to look your best, maybe your ex! Besides having your lipstick in your bag you should always have a hydrating lip balm with you too. This will be useful for those days you encounter crackly and dry lips. You should always keep your lips hydrated, as it can be quite uncomfortable and unappealing having cracked and chapped lips. There is nothing worse than wanting to tie your hair up when you are out but do not have a hair tie when you need it most. Having a few hair ties and a handful of hairpins in your bag will make any bad hair day a great day! This is a must have in your bag. Whether it is summer or winter, you never know when deodorant will come in handy. 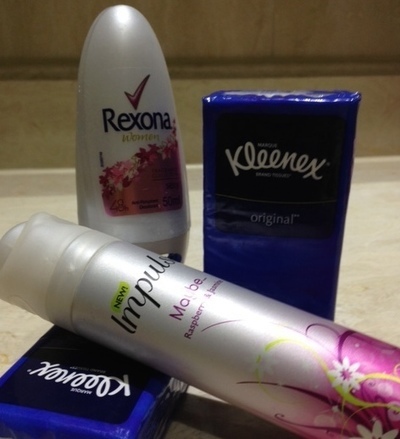 Travel size deodorants are available at leading pharmacies and supermarkets. A small pack of tissues will be useful especially for those cooler months. They are also useful to clean any unwanted makeup mishaps that you face throughout the day. You never know when a tissue may come in handy, so make sure you pack yourself pre packaged tissues instead of shoving loose ones in your bag. For those days you have oily skin, blotting tissues are a quick and perfect way to remove the shine when you are on the go. This will not only remove excess oil, but it will also leave your skin feeling fresh. 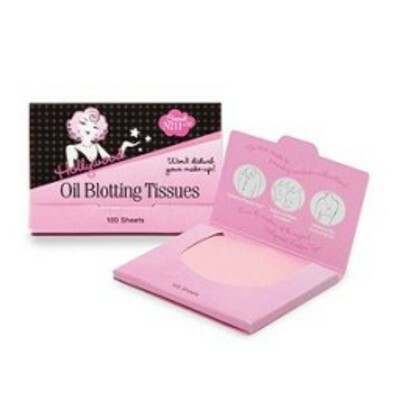 Why not try Hollywood's oil blotting tissues that come in a compact package, which will hardly take up space in your bag. This item kills two birds with one stone. Having your powder wit you will allow you to keep your look appearing fresh after many hours of heading out. Many powders come with mirrors, which will always be useful. Your mirror will be of importance for checking if you have unwanted food stuck in your teeth or to see whether you need to reapply your gloss. It is never a bad idea to have some Band-Aids handy in your handbag. Cuts can be so unexpected you can never be as prepared than having Band-Aids close by. They also come in handy when you start to get blisters from those killer high heels. There is nothing better that using a Band-Aid to stop the irritation of your blister rubbing on your shoe! Just when you think you weren't going to eat something with garlic or with strong aromas. Mints are very handy to have avoiding that embarrassing bad breath wherever you may be. Don't keep all these items loose in your bag! Invest in a mini makeup purse that can fit all these essentials. With all these items being compact and travel size, you won't need a large purse. 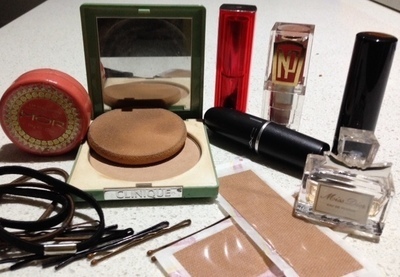 You can purchase beautiful and stylish make up purses from retailers including Priceline, Sportsgirl, Mimco, Myer and David Jones.